It’s a sad fact, but car crashes are the leading cause of death for children ages 1 to 13, according to the National Highway Traffic Safety Administration (NHTSA). In 2016, 38% of children killed in car crashes were unrestrained. This is why car seat safety education is so important. Carefully choose and install the right car seat or booster seat to ensure your child is safe on the road. If you have kids, you know there are many types of car seats. Carefully choose the right car seat for your child based on age and size as well as your vehicle. It’s important that your child remains in the car seat for as long as he or she fits within the manufacturer’s height and weight requirements to maximize safety. According to car seat guidelines, if your child is under 1 year of age, he or she should be in a rear-facing car seat. You should also keep your child in a rear-facing car seat for as long as possible. This seat protects your child’s neck and spinal cord if you are involved in a crash. Once your child outgrows your selected seat per the manufacturer’s top height or weight limit, transition your child to a forward-facing car seat with a harness and tether. Infant car seat: This seat is designed for newborns and can typically be used for the first 8-9 months. Convertible seat: As your child grows, this seat can convert from a rear-facing to a forward-facing seat. This is ideal for children who have outgrown the infant car seat but still need to remain rear-facing. All-in-one seat: This seat can transform from rear-facing to forward-facing to a booster seat. Forward-facing car seats should only be used when your child has exceeded the height or weight limits for a rear-facing car seat (sometime between ages 1-3). This car seat has a harness and tether that limits your child’s forward movement in the event of a car crash. Combination seat: This seat transforms from a forward-facing to a booster seat. A booster seat is the final step before your child is ready for a seat belt. This seat boosts your child up and positions the seat belt so it properly fits your child’s body. Booster seat with high back: A booster seat with a high back boosts your child up to fit the seat belt properly and provide neck and head support. This is ideal for vehicles with low head rests or seat backs. Backless booster seat: This type of seat boosts your child up to fit the seat belt but does not provide additional head or neck support. This is ideal for vehicles with head rests. Your child is ready to transition from a booster seat to a seat belt when the lap belt fits snugly across the upper thighs and the shoulder belt is snug across the shoulder and chest. This typically happens between 8 and 12 years of age. Once you have carefully selected the right car seat for you and your child, it is extremely important to properly install it. 59% of the time, a child’s car seat is installed incorrectly according to the NHTSA. Install your car seat according to the included manual. Depending on your vehicle, you may utilize your vehicle’s lower anchors or tether anchor. As every vehicle is different, it is important to follow all instructions. Once your car seat is installed, schedule a car seat inspection. During this inspection, a certified technician will inspect your car seat and show you how to correctly use it. Find the nearest location for this typically free service on NHTSA’s website. 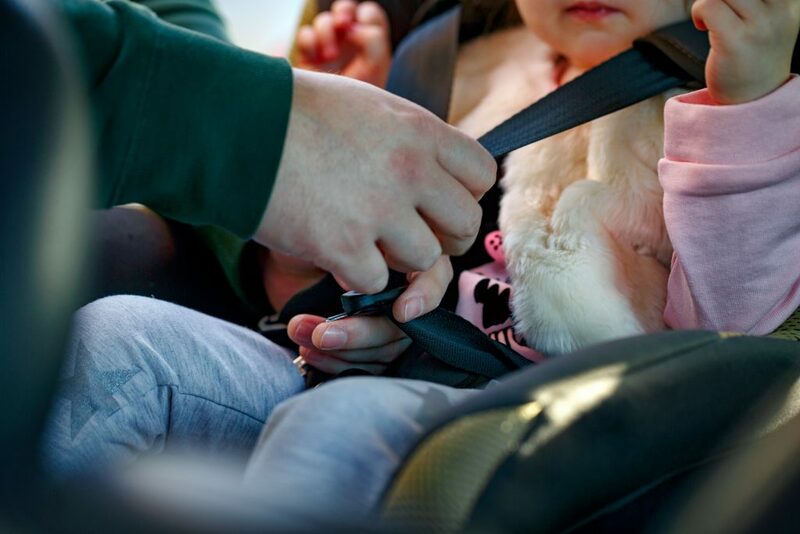 The final step to ensure your child is safe in your vehicle, is to buckle him or her in correctly. Position the chest clip at your child’s chest, level with the armpits. The harness should come through the slots at or below your child’s shoulders and should lie flat. It should also be snug enough you can’t pinch extra material at the shoulder. By following these car seat guidelines, you can lower the risk of death or serious injury in the event of a car crash by 70%, according to the American Academy of Pediatrics (AAP).